What if we don't have to pay taxes for coming 30 years!! What a fine moment it would be for India and Indians when all the money gobbled by Raja and party is recovered and put into India's welfare! What if all money which have been pocketed by Kalmadi and friends is being taken back from their assets and put in use for opening schools with free of cost education and hospitals with free of cost medical facilities in all over India ! What if all money siphoned out of India by Hussan Ali is brought back in India and distributed among all Indians! Can this happen? Yes It can. And we will do it. Watch this video and you would understand who this is possible. What we have to do is understand our moral responsibility of being a good Indian. Our responsibility towards our children to give them a better India. That responsibility can be fulfilled by joining hands India Against Corruption and put our little bit towards this cause. Our first step in this direction should be spreading awareness about this cause to as many as people we can, which is very easy task and we can do it by discussing this matter with fellow people and making opinion in people about the seriousness of this problem. 2nd step is marking your willingness to support this cause and keep an update on this issue. You can give a miss call to 02261550789 . It would keep you updated about this movement. You can like this page and show your interest also. 3rd step is joining hands with Anna Hazare ji and going on fast at you very own place in support of this cause to put pressure on Govt to pass strong Jan lokpal bill as drafted by IAC members. I think all of us can do fast for one day as usually every one does, this time it should be dedicated to this cause( Of course it would please Hanumanji as it would be on Tuesday). Readers can discuss this issue by writing comments below with their names. 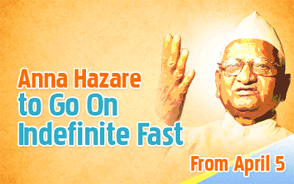 Anna Hazare known as the modern Gandhi.. He's campaign India Against Corruption is a slap on Corrupt minister.. Hats off to him..
Great share, interesting read. Will look into this more.. Such posts aware people as well creates unfavorable conditions for corrupted ones.